Such a great movie, I feel like it's going to be the classic sitting on my shelf that I pick up to watch every few months! It's enjoyable for any Spiderman fan, from new and entrylevel fans to superfans from the 60s. The figurine is cute and is sitting next to my Venom figurine! Wish there had been other figurines too, like of Spidergwen and Peter B. Parker, etc. I liked having the digital copy included with this so I can watch on the go as well. Bought this for my son . He watched it at the theater ,then asked for a copy to watch at home. He is enjoying it very much. Given I have little boys who still love action figures this version that was distributed by WalMart was the best for me. Perfect for any Spider Man fan! Walmart is the only place I could find the movie with the figurine. My son loves it! Does this include an Instawatch copy? If so, do we get it now or upon release of the discs? 1. No, it doesn't include an Instawatch copy. If I preordered this through VUDU, will I still get the physical copy? 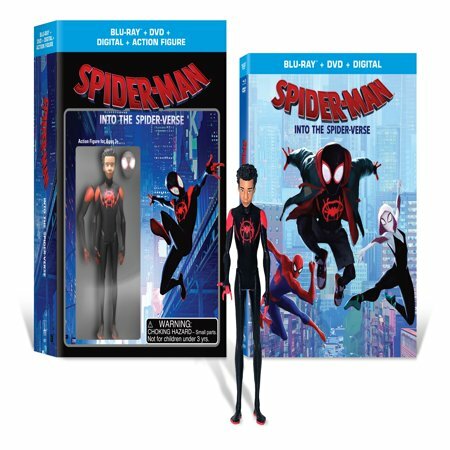 How many inches is the action figure that this movie package comes with?